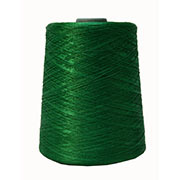 Iris Polyester Merrow Floss Kelly Green # 8636 300/4 Commonly used along with Iris Embroidery Thread to manufacture patches. I recently purchased a merrow machine the MG3U. My question is; can this type of thread work? Response From Enmart: Yes, absolutely. In fact, this thread is designed specifically for Merrow machines and for merrowing patches. It is the same thread our parent company, Ensign Emblem, uses to make the blank patches we sell on this very site.